Who’s Filtering the Web in the Middle East? Libya has shut off web access for its citizens, following in the wake of Egypt, which cut off access to the web at the end of January as a means to stop protesters attempting to oust President Hosni Mubarak. 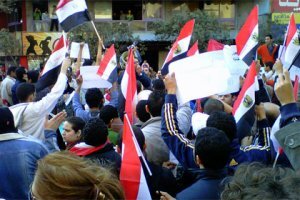 But cutting off communications inside Egypt, and to the outside world didn’t stop the protesters from demanding his resignation and ultimately getting it. In the wake of Egyptian protesters’ success, citizens of Bahrain, Iran, Libya and Yemen have made attempts to change their governments through protests and marches. Last night, Craig Labovitz from web monitoring firm Arbor Networks posted a chart showing what web access inside some of these countries has looked like in the past few weeks, in order to identify more subtle traffic manipulation as opposed to the really obvious total shut down of communication. According to Labovitz, the data shows pronounced changes in Internet traffic levels in two Middle East countries last week: Bahrain and Libya. The post noted that several Bahrain telecommunication companies blamed the slowdown on “overloaded circuits” and extremely high usage. However, neither Algeria, Iran nor Yemen appeared to be messing around with their citizen’s web traffic, according to the scorecard data. In the below chart, we show the “normal” traffic in and out of each country averaged over the proceeding three weeks in green. The dotted red line in each graph shows the traffic over the last seven days. Orange shaded areas indicated periods of statistically abnormal traffic either last week or the week of February 14. Abnormal traffic volumes may network failures or periods of intentional traffic manipulation. Due to the near complete block of all Internet traffic (January 27 – February 2), the Egyptian graph shows orange for most of last week as traffic levels climbed to normal. 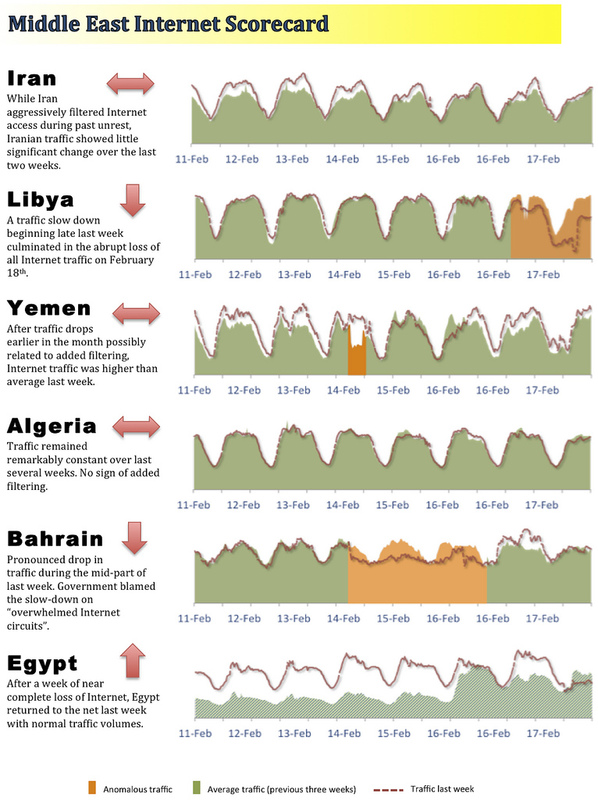 Yemen Internet traffic also exhibited brief, though unusual dips, during the prior week (February 7-11) and also includes an orange period. In the wake of governments cutting their citizens off from the web, and interfering with their access to information and communication, the efforts to build some kind of open technology stack for web access, or at least an intranet over which people could communicate, appear more important. We’ve covered some of those efforts as well as the U.S.’s hypocrisy in drawing a line between web freedoms and the dissemination of information via Wikileaks. But Arbor shows us another tool that can help: the ability to monitor and track web traffic to determine exactly how far governments are willing to go in order to keep their crowns. Ironically it’s using deep packet inspection, the same tool used by repressive or restrictive governments to make sure their citizens stay corralled in a government approved version of the web. Egypt, Lybia and Algeria are in the Middle East? Thank you… last time I’ve checked they were located in North Africa ;-) That’s a mistake every journalists seem to be making today. Perhaps getting this fact right first would lead you to figure out who’s really filtering the web out there. They’re part of the greater Arab/Oil region. Are you one of those who also gets upset over, say, Pakistan being called part of South Asia?